I somehow missed my mocha Friday, perhaps because a made myself two and got overly excited. Life seems pretty busy these days, though I've managed some fun events here and there. Sam and I both have colds, and Joanna continues to be really tired. We played a new game, Avalon, for board game night. The good team won their quests, but Sam and I correctly identified Merlin as Joanna and our assassin got him, winning the game. Yesterday Sam and I played a couple games of Dominion in between his essay writing, along with a handful of Coup rounds. With Joanna taking it easy, I've been doing the cooking and cleaning and such, but I managed a little bit of VR time. I spent some time with Duncan, hopefully getting his grades up. Benny cleaned their room. Emma hung out with her mom for a few hours. We watched more of The Gifted, played some Terraria, and went through her old sketch books. Emma's wanting to go outside and get some biological samples for sketching purposes, and I'm hoping I can help make that happen. The weekend has already come and gone. It was a little rough around the edges, but we all survived. Joanna is still feeling pretty exhausted and isn't able to do much. Duncan and Benny went to the Women's March on Saturday with some friends, as did Sam with his group of people. Emma wasn't over very much, though while she was we had a pretty good time - we visited an antique store and got some art supplies. Sunday we picked up some books at the library and paid off my fines. Sam was around some, though his social life is far more full than mine. I continue to strive to keep the house running - dishes, laundry, meals, and all that. I got some good VR time, playing more Lone Echo and finishing up Super Hot. Duncan and Benny keep bringing over friends to try out VR. This time is was our neighbor Flynn, who though it suitably awesome. It's been nice seeing mom and dad more these days - they've started a steady visitation schedule for various meals. I fret about them all, though my dad in particular seems to be in good shape, building cabinets and running a dental office. We need to organize a family reunion soon - there's been some loose talk of doing it in Eugene, though I'm still hoping for some feedback. I should ask around, I suppose. Joanna celebrated her birthday today. She liked the milk steamer and the carrot cake was pretty tasty. Work has been quiet the last couple days. All the Salt Lake City developers are at a conference, so I've been working solo. Yesterday I got an impressive ten pull requests done. Unfortunately today has been bug fixing and cleanup, so I haven't been quite so productive. I did take Emma and Benny to school, stopping by Hideaway Bakery for a mocha and almond croissant. I think everyone is generally doing okay. Benny has a friend over. One of Sam's groups is being part of a documentary. He's been asking me questions about technical ways to get latitude and longitude from an address, but I think he figured it all out. Emma's writing skills are improving, as shown by some of her essays she wrote for Honors English. Joanna got six vials of blood drawn this morning - hopefully we can figure out why she's being so tired. I'm hoping the weekend is generally quiet and pleasant. I'm itching to get back to virtual reality, though we'll see if the kids let me play. We were just told that the project I'm working on is going to be called "Measures Manual". In theory it's not supposed to be abbreviated, but the design team gave us some MM icons, which reminded me of the real MM, the D&D Monster Manual from years gone by. I do enjoy working with fellow nerds. The week is moving along mostly uneventfully. Emma and I went for a tromp through Hendrick's Park on Monday, enjoying the misty trees. Emma took a bunch of pictures of plants and fungi, then we retired to Humble Bagel for lunch like in times past. Sam returned from his camping trip, where he and his friends had a good time. I think he feels somewhat resourceful, making a fire despite the damp weather, and enjoying the high forest. Duncan had his friend Ash down and we put him in VR for a long while in the afternoon. Ash's dad is a fellow computer guy, so he was grilling me on the Oculus Rift. Emma, Benny, and I all had different turns playing in VR. I finished I Expect You To Die, which was tremendous fun. Benny's been enjoying The Climb, excited to unlock hard mode where it's set at night and you have a head lamp. Joanna's been somewhat on the mend, perkier than last week. She's been working more and setting up various events for the weeks ahead. I heard that work is doing a get together at the end of February. Hopefully I can beat altitude sickness and hydrate properly. I'm slowly getting the hang of all this travel stuff. Joanna continues to be pretty exhausted, though she's a little perkier this morning. We've been mostly hanging out this weekend. I managed to put away the last of the Christmas stuff. I took Benny shoe shopping, returning empty handed, though with a shoe order hopefully bringing it home soon. Duncan went to the beach with his friend, strangely running into his kinda girlfriend while he was there. Benny and Emma played a lot of VR. Pizza was made. Mom and Guillaume came over for dinner last night. I did a lot of laundry. As for today, I'm hoping to get outside. Theoretically Sam returns from Waldo lake, though he's out again tonight. Tomorrow I need to remember what complicated thing I need to do to make the chicklets show up properly (yes, we're calling this graphical element thing a chicklet). It was a fairly exciting evening, getting all the kids ready for the day. Emma has projects due and an essay in Honors she has to write, so she was fretting away. She had me printing out pictures of assorted people for her French class project and has to respond to questions about her family in French today. Sam was digging through all the camping gear, trying to get he and his friends ready for a trip up to Waldo Lake. Hopefully they have a good time. It was nice having Emma around last night. We chatted and she played more of the VR game I Expect You To Die, managing to survive an ascent in a mini-sub to the surface. I finally finished setting up the Rift sensors the way I wanted, so I'm excited to try some of the better VR games soon. Joanna is still feeling pretty wiped out, and she has a fair number of things to do today. Hopefully she can sleep in this weekend. I think we're mostly taking it easy, though I need to take Emma clothes shopping and Duncan needs a backup. Joanna's birthday is looming in ten days, so I have to get cracking on that soon. Nothing too exciting to report. Sam's been busy with classes. I got kinda sick last night, but perked up by the morning. Joanna and I are going out on a date tonight. I had another boss added to the list of people I kinda report to, though Health Catalyst's organizational structure is always pretty flexible. We had our first meeting today, which went well. I think he wants to pick my brain about some security stuff he worries about. Looking forward to the three day weekend. Sam's off hiking with friends, so it'll probably be kinda low-key. Joanna seems to have acquired the cold that's been going around endlessly. I left her in bed surrounded by a pile of tissues. The weekend has been pretty low-key. We applied some motivation to get Duncan to finish his missing school assignments. The Christmas tree came down. Emma arrived later in the day. Sam went out to hang out with friends until late last night. I played some more of the VR games I hadn't tried. Emma and I walked over to mom's to steal away some of her records from her collection, while secretly checking up on her. She seems in good spirits, though her foot apparently pains her more than expected. 4-6 weeks until the brace comes off, apparently. We had a big, tasty breakfast this morning - pancakes, bacon, sausages, hash browns, grits, assorted fruit, and a mocha for me. Sam and Emma helped, which made it slightly less crazy. I must have good memories of big breakfasts on the weekend as a child, as I feel obligated to continue the trend. Emma and I are walking down to get my hair cut, with promises of a Metropol treat at the end. Sam's off with friends again. Duncan and Benny are Minecrafting with friends. It should be another low-key day. Danica's benign mass behind her eye was discovered to be malignant and they weren't able to remove it during surgery last night. Radiation and chemotherapy are the recommended treatment options. Yayoe fell and fractured her spine. She's on a lot of pain meds and slowly recovering. Her hope is that she'll return to yoga and normal activities in a few more weeks. Mom twisted her ankle and her sprain turned out to be some broken bones. She's in a brace, though she reports she isn't in any pain. John's surgery on his pacemaker went well, though his ongoing issues continue. Bob's surgery to repair his artery patch is coming up. After some exploratory surgery the doctors felt the outcome was good. Joanna and Duncan both have coughs. Benny and Emma's are slowly fading. Emma has stomach pain, probably from taking antibiotics. Her jaw issues continue where the TMJ will "lock up" until she does this certain twist and push move. Joanna's fatigue levels continue to be high these last few months. My eye cyst is apparently gone after a week of treatment. I bought reading glasses and occasionally use them, though I'm hoping I can get my contact lenses sorted out - I think the ones I got a couple months ago are the wrong prescription. I'm obviously fretting the most about Danica today, though the sheer number of health issues in the family are feeling a little overwhelming. I think we're all treating what can be treated, though these virus outbreaks are really starting to wear me down. As for everything else in life, it's generally doing okay. The kids are settling into school, with Sam starting classes next week. It turns out he got A-'s in all his classes last term. Work is going well for me - I optimized an extremely slow process from an hour down to a little over a minute. Joanna and I are doing a date night, though with a sick babysitter we'll likely do an in-house one with kids watching a show in the basement. May we all make it to spring. I return to work tomorrow, back to a technical problem I set aside before New Year's break. 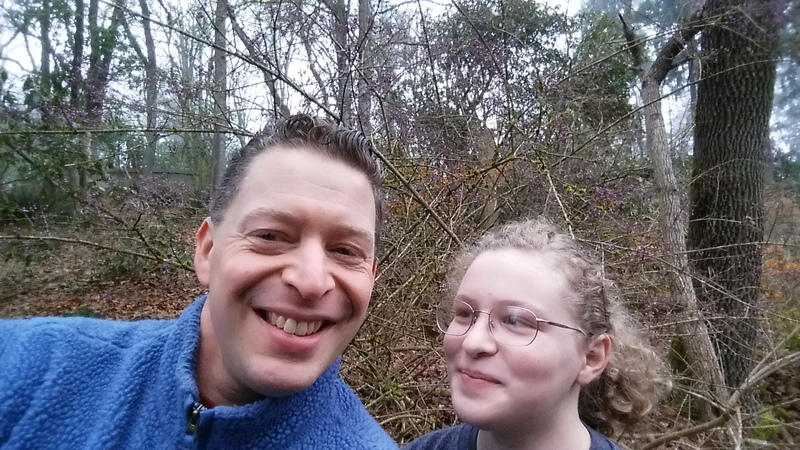 It's been great fun hanging out with Sam and Emma, playing games, going for hikes, and hanging out. Poor Joanna had a rough time flying back from Rochester - they got into Eugene late, minus their luggage. Fortunately there was an exceptional airline employee who helped guide them home the same day - Joanna called her back and got enough information to write a nice note to the airline. Tuesday morning was a small Christmas for Duncan and Benny. They all missed their computers, so they spent most of the day checking videos and playing games. I got them both into VR. Benny's new favorite game is I Expect You To Die, where you play a super spy getting out of impossible situations. I think they enjoyed dying horribly in multiple ways. All the kids but Sam started school today, which they mostly survived. Duncan started getting the cough, poor kid. My mom let us know she actually broke her foot, which apparently doesn't hurt too much but is annoying. Sam and I spent today running errands, depositing money, buying exercise clothes, and getting flu shots. I finally picked out some reading glasses, attempting to embrace my age. We're slowly picking up from Christmas - the tree is still up for a few days. I hope we all survive to Spring. If not, there's always virtual reality. It's been a good, if quiet, last few days. Joanna and the little kids are stumbling back home. Their flights were canceled, but the managed to find a way to get to Eugene by 10 p.m. tonight. It'll be nice to have everyone around again - I'm looking forward to showing the kids VR tomorrow. It's been a nice few days with Sam and Emma. We played a lot of board games, hiked at Pisgah yesterday, made dinner together, and watched an old episode of Mythbusters we'd missed. Out-of-school Emma seems much more relaxed, despite her cough still lingering. We've been chatting, looking at pond scum in my dad's old microscope, and generally having a good time. Sam hung out with friends some and we played a bunch with VR today. I think he's starting to realize that school and social obligations will soon eat up all his free time. It's nice to spend time with him while he's around. I think I'll do a quick store run to get some things I missed food shopping yesterday, eat some dinner, play some VR games, and then get everyone from the airport. I've finally had a chance to play with the Oculus Rift, usually alternating with Sam as we try out different experiences. We're saving the best games a little, waiting for the setup to be finalized and perfected. The intro games for both Steam VR and Oculus are pretty darn good in themselves, short but providing a taste for different experiences. In terms of full games, I've enjoyed the psychological horror/puzzler Wilson's Heart, though I occasionally get stuck on puzzles. Robo Recall is great, disassembling robots in a variety of ways. Both Sam and I really enjoyed that one. Sam played The Climb, which looks really pretty and strangely a good upper body workout. You climb various cliffs, leaping and strategizing your way to the top. The hardware issues occasionally drive me bonkers, and I've ordered a few cables to get ready. The sensors are a bit of a hassle and right now they're duct taped to the walls, looking pretty ugly. Once I get things settled down, I'm really looking forward to Echo Arena, which is a story-driven space game that's been ranked the best of the year.